Welcome to February! I know I’m a few days late, but it’s still within the first week, so that counts, right? February is one of my favorite months of the year—quite possibly THE favorite month, but I could biased. Full disclosure, I will be sharing a lot of “pink” themed items (including recipes) over the next few weeks, of which this will be the first. After years of cardigan-reign, I’ve recently decided that I love sweather* and should therefore wear more sweaters. 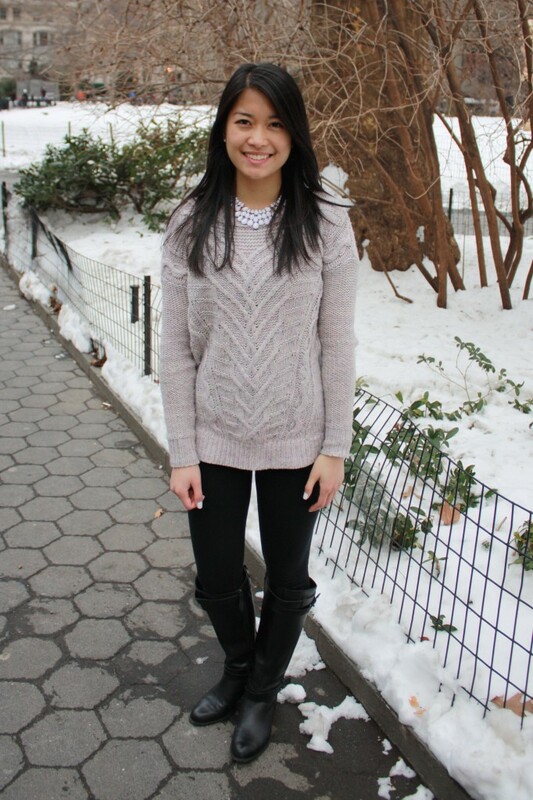 Among my slowly-growing sweater collection, this casual cable-knit is right at the top! This beautiful sweater is made out of a blended multi-color yarn—primarily a soft pink, the hints of icy grays, blues, and whites add an extra level of visual dimensionality and character. I also adore the chevron pattern along the front, also providing some additional sweater flare! I added a prominent white necklace to draw enough visual attention to my neckline, but not enough such that it would detract from the fine features of the sweater itself. In fact, I find that the symmetry of the necklace drop and chevron pattern work symbiotically to create a cozy-chic look. When I made the purchase, I noticed sweater was advertised as a “legging sweater”—a what? Apparently, sweaters (and tops in general) can be intentionally made to feature a longer body, providing additional frontal and rear coverage and safety when choosing to pair them with leggings. What a neat feature! Now, I’m putting it down in writing that I favor leggings as pants, but not without a qualifier: they must be completely opaque (no questionable transparency) and of ample thickness (no questionable lines). Leggings offer a perfect pairing to any type of fall or winter boot or bootie, and offer a clean look when worn with a looser top. The eyes aren’t drawn to “plain” leggings, so the attention goes to highlighting the top with the boots/booties. Plus, they are super comfortable and keep my legs warm! I choose to feature a simple color-block cross-body bag against the sweater; it’s cute, functional, and simple. Sweather to me means optimizing “cozy and comfort” with “winter chic” and this bag is a winner in my book. It was a personal-spend item (that didn’t break the bank thanks to awesome Kate Spade deals!) that has a high versatility rating; I’ve brought this to business meetings, classy dinners, casual outings—you name it! I think a go-to cross-body is a must for any woman on the go. What are your thoughts on sweaters? Do you have any colors or length preferences? Or share with us YOUR go-to it bag! I must now apologize for the poor color quality reflected in these pictures; I am such an amateur dslr user that I rely on the auto settings and have yet to learn how to set exposures, shutter speed, aperture, etc. on my own. Thank you for putting up with it and visiting pennyforherthoughts. It means a lot to me that you’re here! Stop by again soon for a pink-themed macaron post on the other side of this weekend–the egg whites are geared for prime meringue-ifying very soon! Super cute! I love the sweater and how you matched your nails to your jewelry! I can’t wait to see more!